BENGALURU: The setting was similar, the moods contrasting. Three years ago, when the then Tamil Nadu chief minister J Jayalalithaa was driven into the Parappana Agrahara jail in Bengaluru after being convicted by a trial court in the disproportionate-assets case, slogan shouting AIDMK cadres and loyalists had thronged in thousands in a show of support. 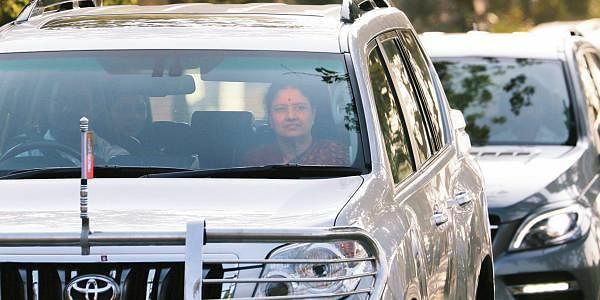 On Wednesday, it was largely journalists and curious locals who milled around the central prison entrance as V K Sasikala made her way into the premises, having travelled by road from Chennai to surrender. Sasikala, a co-accused in the disproportionate assets case, was handed a four year sentence by the Supreme Court on Tuesday. Female supporters of the party, who were a visible presence during Jayalalithaa’s time were conspicuous by their absence. This is a striking sign of the general disgruntlement among the rank and file of the party, even if muted, over Sasikala’s attempt at appropriating Jaya’s legacy. However, Karnataka AIADMK unit secretary V Pugazhenthi believes that the verdict was a result of the case foisted by DMK. “We are confident that she will come out of this and continue to lead the party,” he said. A few supporters from Sasikala’s native Mannargudi were also present ioutsideof the jail. Some AIADMK partymen said they are worried about the Sasikala’s safety in Jail. “Our vehicles were attacked a few meters outside the jail despite heavy police presence. Then, how can they ensure the safety our leader Chinnamma?” asked M Maheswaran, an AIADMK leader based in Kancheepuram. “I am not supporting Sasikala but I thought of seeing her since she is coming here” said Pankajam K, a local vendor. At 5.15 pm, Sasikala and her co-accused Ilavarasi reached the jail after a day-long wait by her supporters. An hour later, another accused Sudhakaran also reached the prison. A few AIADMK leaders including deputy Lok Sabha Speaker Thambidurai, Sasikala’s husband M Natarajan, Ilavarasi’s son Vivek, Dr S Venkatesh, son of Sasikala’s brother Sundaravadanam were among those present at the jail premises.